If ever you hear yourself say this seemingly innocent little sentence, alarm bells need to go off. The “I’ll put it here” part is fine. It’s the “just” and “for now” bits that give the game away. It usually means you’re about to create clutter! “Just” is excusing yourself, and attempting to minimalize what you are doing. “For now” is usually a barefaced lie. What most people really mean is, “I’ll just put this here for the next ten years or so”. Of course there are some situations where “for now” may actually mean what it says. One is when you bring an item into your home that needs to be fitted, installed or have something more complicated done to it than simply being given a place where it belongs. Providing this fabulous improvement really does happen within a reasonable timescale, “for now” is not an excuse but a necessary part of the process. Another is when you’re about to take something out of your home, so you put it somewhere where you’ll see it and remember to take it. And see it you do. Today. Tomorrow. And all the following days after, glimpsed out of the corner of your eye. If it’s still sitting there a week later, it will have silently mutated into clutter. Then, of course, there are the times when you’re in full-scale clutter clearing mode, and you diligently go around your home at the end of your session, using the Transit Box method I describe in my Clear Your Clutter with Feng Shui book, relocating things to where they belong. But if they belong in an area you haven’t yet clutter cleared, what can you do? There may not be space for them yet, so you can only put them somewhere close by “for now”. In this situation, it’s the best you can do. Just make sure “for now” doesn’t turn out to be “forever”. There are many short “for nows” in daily life that are perfectly fine, such as the toothpaste cap you leave on one side while brushing your teeth, or the cooking pots you leave to wash until after you’ve eaten your meal. The ones to watch for are the long-term “for nows”. The mirrors or pictures leaning against the wall, waiting for years to be hung. The things you throw in your cupboards, drawers, junk room, attic or the garage, to get them out of the way. 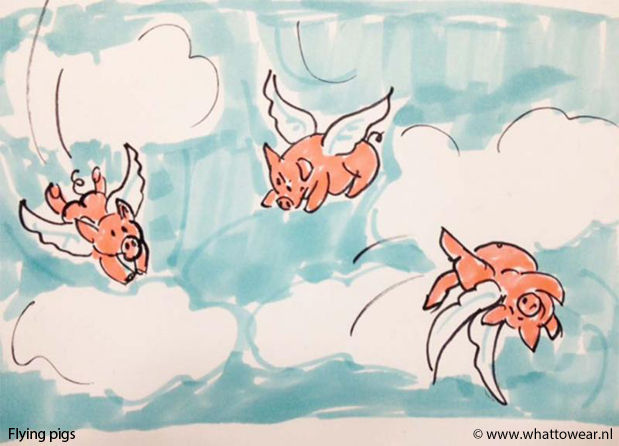 You may fully intend to do something about them one day, but it may also be statistically more likely that pigs will fly. So clutter of this type stagnates the energy of your home and clutters your psyche as well, because it is a job nagging away at the back of your mind to be done. The remedy is so easy and simple. When you find yourself about to put something somewhere “just for now”, take the extra few seconds to put it where it really belongs. Your home will be less cluttered and you’ll feel better too, because you won’t be adding to your burden of things to do. It’s the things you put off doing “just for now” that become your frogs of tomorrow. My mother Ann Miller always said, “Don’t put it down, put it away.” You have my permission to reprint her quote. It underscores your philosophy and inspires change. Karen, Thank you for years of inspiration. I read and recommend your books to others all the time. I’ve been a true fan for decades. Long ago, I attended a weekend of your classes in California and recently participated in an online class. Martha Hayden, one of your wonderful and sensitive space clearing experts inspires me when she is in Chicago. I look forward to your informative newsletters and appreciate having your positive influence in my life. I totally agree with you – letting yourself think that you’ll temporarily put something down and come back to it later is a quick way to get stuck with more clutter. It is a hard habit to get out of, it’s the way we deal with many things in life. Cutting things up into smaller jobs can make this easier; instead of tackling a whole room or an area I divide it up and do a small area that doesn’t take much time and won’t stress me out. I used a transit laundry basket once when I was cleaning, and it was a disaster! I didn’t empty it for several months! I typically grab several things at a time and just take them where they need to go immediately. I definitely have more trouble with procrastination than distraction.